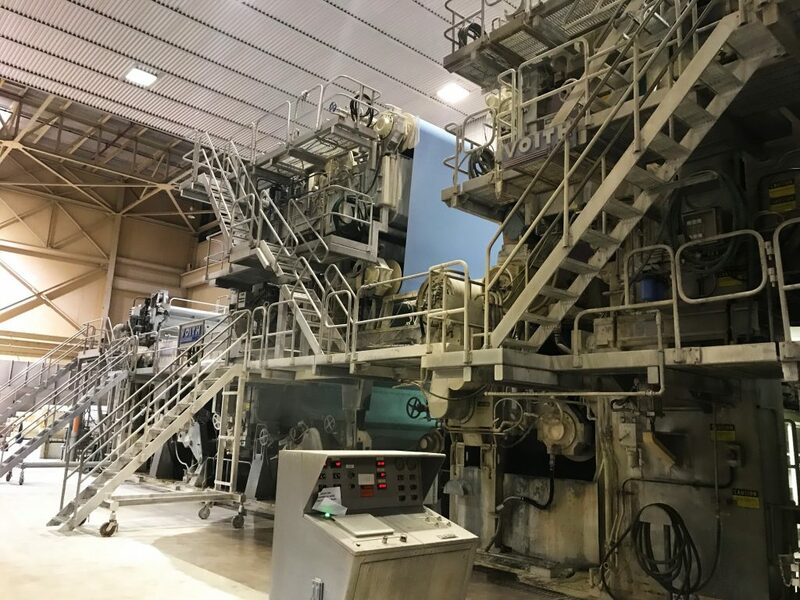 Kobayashi Paper Machine • 2016 Installed Batch Pulping System • Refiners, Pressure & Vibrating Screens • Cleaners, Flotation Cells, Hydrasieves • Clarifiers, Thickeners, Stainless Tanks • Boiler, Air Compressors & Electrical • Mobile Material Handling Trucks • New Spare Parts, Maintenance Shop • Large Assortment of Stainless Pumps • And More! Complete Tissue Manufacturing Plant • Tissue Manufacturing Support • Power Generation • Plant Electrical • Copper Wire • Rotary Kiln, Pulp Digester & Recovery Buildings • And More! Paper Machinery • Boilers and Compressors • Machine Shop • Pumps & Motors • Material Handling • Multi-Million Dollar Spare Parts, Supplies, Spares Inventory • And More! Sandy Hill • Paper Making Line • Pulpers • Pressure Screens & Deflakers • Shredder, Roll Splitter & Paper Cutters • Cleaners & Strainers • Converting Equipment • Lab Equipment • Pumps & Valves • Full Machine Shop • Factory Support Equipment • And More! (2) Complete De-Ink Plants • (22) Late Model Pressure Screens • (2) Beloit Paper Machines • (20) Nash Vacuum Pumps • (2) Steam Turbine Generators • Complete Plant Electrical Grid • (25) Motor Control Rooms • Power & Facility Equipment • (10) Bridge Cranes to 50 Tons • New Spare Parts & Supply Inventory • Over (100) Stainless Pumps to 800 hp • Forklifts & Mobile Equipment • Complete Maintenance Shops • And More! Comact Edger Optimizing Line–New in 2006–Original Cost $1,600,000 • Ring & Drum Debarkers • Hogs & Chippers • Resaw • Edgers • Trimmers • Sorter • Stacker • Slashers • Log Loaders • Kilns & Furnaces • Truck Scales • Scanners & Conveyors • Large Quantity Stores & Spares • Plant Support Equipment • And More! Bale Dewiring & Pulper Buildings • 500 MTPD Deinking & Bleach Plant • Beloit 220” Trim Paper Machine • Screw Presses, Filters & Cleaners • Additional Paper Machines & Support • Plant Support Equipment • Plant Electrical, Cable & Motor Inventory • New Parts & Supply Inventory • And More! Multi-Million $$ New Stores Inventory, Pumps, Motors, Bearings, Valves, Controls, Transformers, Stainless Steel Pipe, Wire, High Pressure, Steam, Hydraulic Fittings • Caterpillar 3508B 1,000 kW Diesel Generator • Paper Converting Equipment • Forklifts, Crane, Racking, Compressors • Machine, Weld, Fabrication Shops • And More!